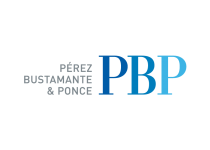 Pérez Bustamante & Ponce (PBP) is the largest firm in Ecuador, considered a leader in the legal market and a trusted advisor for national and international clients. It has offices in Quito and Guayaquil and outreach throughout Ecuador. PBP endeavors to understand clients’ challenges and needs. Its multi-practice teams – integrating expertise in 17 practice areas - have an industry focus and an in-depth understanding of the specific challenges of each sector. PBP has consistently been honored as Ecuadorian Firm of the Year by Chambers Latin America (2017, 2016, 2015, 2014, 2013, 2011, 2010 and 2009) and by Who´s Who Legal (2017, 2016, 2014, 2013, 2012, 2011 and 2010).